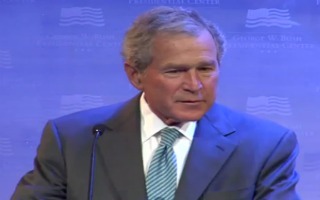 The always eloquent and erudite 43rd President, George W. Bush speaking before the NY Historical Society on Tuesday. George W. Bush still doesn’t get it. Even after 8 years in office during which he lowered taxes on the wealthiest Americans, deregulated the banking industry, took the nation into two wars without a clue about how to pay for them; all of which resulted in the Great Recession and the largest recorded deficits in American history, the 43rd President of the United States yesterday denounced President Obama’s call for raising taxes on the richest Americans. “..some other body’s tax cuts…” Isn’t GW just as eloquent and in command of the English language as always? Governor Chris Christie of New Jersey wants you to believe that higher taxes on the rich will discourage the poor from seeking their dream. Huh? How does raising taxes on the rich make for more people sitting on their sofas waiting for a government check? When Obama says increase taxes on the rich, Christie observed, he’s actually discouraging all those poor people from following their dreams and striving to be more than who they are. So according to Christie, a person who doesn’t have enough money for rent and food is not going to try and find a better job or pursue more education and training because if they get rich, the socialist in the White House who will just take their money away through taxes. What’s more shameful and frightening than Christie’s logic is the fact that so many of his own supporters take full advantage of government programs like Social Security, Medicare, Medicaid, Unemployment Insurance and Veteran benefits. But facts aren’t the point. 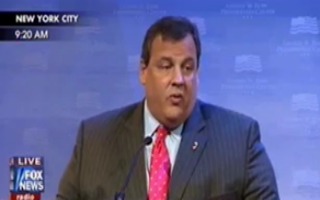 Because Christie is not talking about working-class Republicans. Phrases like “couch sitters waiting for government checks” are of course conservative code words for new immigrants and people of color none of whom as we all know, have any interest in doing an honest days work. But rest assured that Koch brothers and other one percenters who couldn’t care less about the environment, education and health care and are indebted to politicians like Bush and Christie for helping them to continue to treat the United States of America as nothing more or less than their personal ATM machines.